Kudos to Glen Falls Post Star columnist Will Doolittle for his tart September 22 column exposing that “Water stinks… as expected” coming from a pipeline built for a microchip fabrication plant in Saratoga County, upstate New York. The costly water line was built for the factory but three cities tapped into it, as “a token public face on the line’s real corporate purpose,” writes Doolittle. But they need so little that “the chlorine in the water breaks down in the pipe, making it smell like a swamp,” he explains. It’s the latest episode of subsidized sprawl (the Kansas City Star did a great series on that issue 16 years ago!) and of subsidized interstate job flight across the Missouri-Kansas state line that was decried by 17 prominent business leaders there just last April. The AMC drama has played out for a year and a half and is one of the reasons the Missouri state legislature is now holding a special session on economic development. Who has the best title for a movie about subsidized corporate job flight from distressed cities at your local AMC theater? In an extraordinary investigative report this week, The [Memphis] Commercial Appeal discovered that the state of Tennessee promised Electrolux much more in subsides than it officially announced and that the offer came with an explicit “no clawback or recapture” provision. The newspaper reports that in addition to the officially announced $153.6 million subsidy package, property tax breaks and local grants and loans increased the total to $188.3 million. With 1,240 projected jobs, that’s almost $152,000 per job. A total of 183 workers at VWR International are facing permanent job loss as the company plans to relocate its facility from Brisbane (just south of San Francisco) about 230 miles to Visalia, California – into an industrial park subsidized by $2 million in U.S. Department of Commerce Economic Development Administration (EDA) funds. Teamsters in Brisbane have had a contract with the company for more than 50 years, but VWR is denying them the right to follow their work. In a September 8 letter to the Commerce Department protesting the deal, IBT General President James Hoffa is urging that it rescind the EDA grant to Visalia. Suspiciously, Hoffa’s letter points out, when Visalia applied to the EDA for the funds, it omitted the name of VWR from the list of beneficiaries—even though VWR is almost three times larger than any other listed park tenant. In Highway Robbery: The Road from Brisbane to Visalia, How VWR is Using Taxpayer Funds to Destroy Jobs, the Environment and Communities, the report of a special investigation co-chaired by Congresswoman Jackie Speier and California State Treasurer Bill Lockyer, experts estimate the total job loss in Brisbane/San Mateo County at 266 jobs. The shutdown would also cost the City of Brisbane almost a fifth of its general fund revenue. In a related revelation this week, Good Jobs First has learned from the Teamsters that Acting Commerce Secretary Rebecca Blank is taking the Teamsters’ complaint seriously, citing an EDA policy against subsidizing job flight from one labor market to another. Further research reveals that this EDA policy dates to the summer of 2009, when EDA got caught in a dispute involving federal stimulus dollars (funneled through EDA) for interstate job flight. Although the EDA policy memo doesn’t name names, avid readers of Clawback will recall that in June 2009, we cited the case of NCR relocating jobs from both Ohio and South Carolina into facilities near Atlanta, Georgia. One of those relocations, involving the manufacture of ATMs, was originally slated to be subsidized by about $5 million in stimulus monies via EDA. When public officials in Ohio protested the move (although jobs from South Carolina were actually moving into the EDA-backed facility, Ohio was losing a big corporate headquarters that had been in Dayton 125 years), the White House quickly removed the stimulus funds from the deal. Now we learn, from the EDA policy memo that opens by referring to a summer 2009 “Recovery Act grant application that resulted in significant adverse publicity because of an accusation that funding would have facilitated the relocation of jobs from one community to another,” that in response to the NCR controversy, the EDA developed a “four-pronged nonrelocation policy.” Although the policy can be waived under certain circumstances, it would appear to disqualify runaways like VWR in Visalia (caveat: I am not a lawyer). By adopting this policy, the EDA actually rejoins the ranks of virtually all of the major federal economic development subsidy programs with anti-piracy safeguards. Indeed, an alleged violation of EDA’s former anti-relocation policy was part of a plant-closing lawsuit I worked on 20 years ago that won $24 million for dislocated workers. And the existence of anti-piracy rules in numerous federal subsidy programs convinced the U.S. Solicitor General to not intervene for the defendants in the case of Cuno v. DaimlerChrysler that the U.S. Supreme Court considered in 2005-2006. The existence of these federal anti-piracy rules (like state and local clawback laws) are the bitter residue of numerous plant closings blowing up in the faces of public officials over the decades, revealing the abuse of taxpayer dollars. Determined to go down swinging, workers like those at Briggs & Stratton in Milwaukee (who won anti-piracy rules for HUD Community Development Block Grants by protesting runaway shops in 1994-1995) have won rules that protect us all today. I hope that the EDA’s nonrelocation policy does indeed apply to this Visalia case and that VWR International will stay in Brisbane, where it has operated profitably for so many decades with its highly skilled workforce. And if you suspect federal monies are subsidizing job flight, call Good Jobs First. Subsidy Tracker, the Good Jobs First database of company-specific information on economic development subsidies, has reached a new milestone: We have finished capturing all available online data from state programs around the country. The database now contains more than 112,000 entries from 246 programs in 41 states. A complete list of sources is here. Our latest batch of new data covers 16 additional programs in six states. One of those states is South Dakota, which recently began publishing subsidy recipient data for all of its largest programs. Alabama appears in Tracker for the first time with data on its Industrial Development Training program. We also expanded the number of years covered for 53 programs in 15 states. See below for a full list of recent changes. Now that we have completed assembling data from a vast array of online sources, we will focus our attention on getting more unpublished data from state agencies, especially those states that don’t have any online recipient disclosure. Subsidy Tracker already contains unpublished data from 14 programs in 11 states. We will also begin to look at selected local subsidy programs. We have made improvements to the search engine, including a new feature that displays state-specific dropdown menus for categories such as program name, city and county. This allows for more focused searches. Yet despite the fact that tax breaks are invariably justified in the name of reducing unemployment—not to mention the fact that more Americans have been unemployed for longer periods of time in this Great Recession than any downturn since the 1930’s—it’s legal for companies getting subsidies from states, cities or Uncle Sam to turn away applicants just because they are currently unemployed. NELP rightly emphasizes how many job seekers there are for every job opening. We would add that, given higher rates of unemployment among people of color and younger workers, excluding unemployed applicants can only worsen discriminatory patterns. If major economic development subsidies were reformed to prohibit this practice, it would greatly benefit millions of unemployed Americans. That’s because federally funded programs such as Industrial Revenue Bonds, Workforce Investment Act grants, and Community Development Block Grants are ubiquitous—as are state-enabled subsidies such as property tax abatements and investment tax credits. Another federal remedy has also been proposed: House and Senate versions of the Fair Employment Opportunity Act of 2011 (already with 35 House co-sponsors) would prohibit companies and employment agencies from refusing to consider applicants solely because they are unemployed. In a recent radio talk show, President Obama endorsed the legislation. As Good Jobs First documented in 2008 in Uncle Sam’s Rusty Toolkit (co-published with NELP and others) five of the most common federal job subsidies lack many of the taxpayer safeguards that are becoming increasingly common at the state and local level, such as online disclosure of company-specific costs and benefits, money-back guarantee clawbacks, Job Quality Standards, location efficiency and green building standards. To that list for both the states and the feds, we would add: no discrimination against applicants just because they are unemployed! The location of the future Gaylord convention center complex. As the 10th anniversary of September 11th attack on the World Trade Center approaches, it is a good time to review what happened with the subsidies that were allocated to large firms to help them deal with the effects of that tragedy. It turns out that some companies that received those subsidies, including Goldman Sachs, failed to meet their job retention or creation goals, and some have had to repay funds to New York State. Good Jobs New York has just completed an analysis of the Job Creation and Retention Program (JCRP), which was created in the wake of 9/11 to encourage major employers in Lower Manhattan to remain there and to encourage others to relocate to the area. JCRP, which is administered by the Empire State Development Corporation (ESDC) and its subsidiary the Lower Manhattan Development (LMDC) Corporation, has awarded about $304 million in Community Development Block Grants to 91 companies. These funds come from a special $2.7 billion allocation for various rebuilding efforts in Lower Manhattan after 9/11. Goldman Sachs which received $22.9 million of a $25 million JCRP grant, has not complied with its commitment to retain 8,100 jobs. The state has not clawed back funds, but it will most likely not allocate the remaining $2.1 million the firm is due. 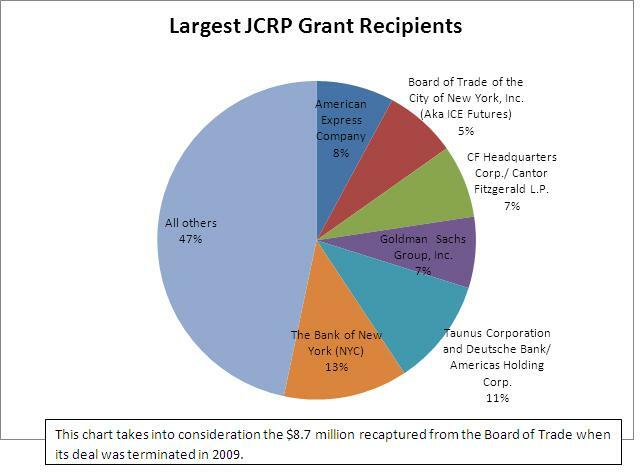 Six firms received about half of all JCRP grants, (see pie chart 1). Approximately $13.4 million was recaptured from firms for not being in compliance with their agreements with the Empire State Development Corporation, (see Table 1). 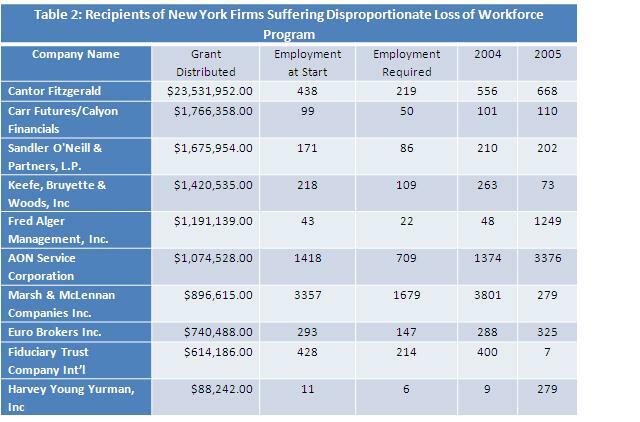 Nine firms that were especially hard hit by the attack received a special allocation of $33 million in CDBG funds under the “New York Firms Suffering Disproportionate Loss of Workforce Program” (see table 2). As part of our analysis we obtained copies of 19 JCRP agreements between firms and ESDC. JCRP grants were allocated by the (ESDC) and/or its subsidiary, the (LMDC) but compliance falls under the ESDC. We have posted these documents here and have summarized their content in our Database of Deals along with summary information about the other recipients. We also requested copies of the applications firms submitted for the JCRP funds, but some of them were unavailable because they had been destroyed, we were told, in a flood at ESDC offices. Missing applications included those of Goldman Sachs and American Express. It is interesting that the applications submitted by HIP and Deloitte Consulting said the firms were under no immediate pressure to move but they received the grants anyway. Nearly all the applications we reviewed warned that the firms were considering moving their facilities to neighboring states; many said they might remain elsewhere in the city. Goldman’s Subsidy Reach: Goldman Sachs, one of the largest beneficiaries of post 9/11 resources, has received $22.9 million of a promised $25 million grant. Goldman benefited tremendously from government incentives after 9/11, including Liberty Bonds and a special lease agreement with the Battery Park City Authority for its new office tower. Details on Goldman’s subsidies are here. However, as of December 2010 Goldman was not in compliance with it job commitments. Employment was 8,100 in 2005 when its agreement was made but in 2010 the firm’s employment was 7,472. As of the end of 2010, ESDC had yet to recapture funds from Goldman Sachs but the firm will most likely not receive the remaining $2.1 million it was promised. 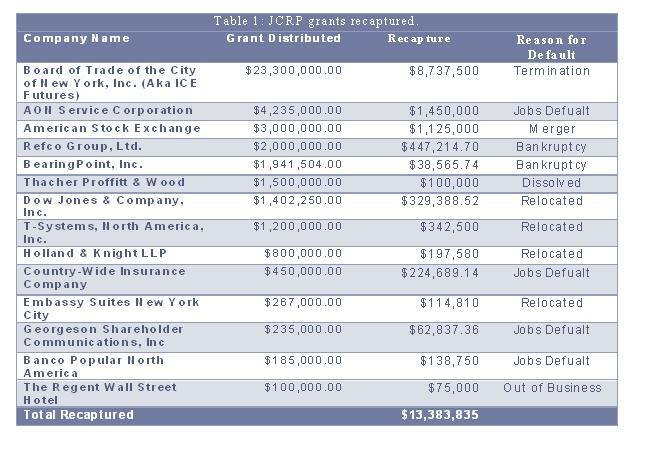 Banking on the Bank of New York: The largest JCRP grant of $40 million went to the Bank of New York. The Bank also benefited from a $90.8 million allocation of Liberty Bonds to FC Hanson for its building above Atlantic Terminal in Brooklyn. Details are available in our Database of Deals. Deal with Deutsche: On 9/11 Deutsche Bank occupied two buildings impacted by the attack: 130 Liberty Street, directly across the street from the WTC and 4 World Trade Center. In return for keeping employees in Lower Manhattan, it received a $34.5 million JCRP grant. The redevelopment of the 130 Liberty Street site has hit several bumps, including the need for the negotiation skills of former US Senator George Mitchell to forge an agreement with the various interests (Deutsche Bank, New York State via the Lower Manhattan Development Corporation and insurers). In the end, the Lower Manhattan Development Corporation bought the building in 2004 and has spent approximately $277 million for acquisition, demolition and developing 130 Liberty Street with the expectation of turning the property over to the Port Authority of New York and New Jersey. Demolition of 130 Liberty Street raised the ire of residents and local elected officials who were concerned that if it is not done properly, the contaminated building could be an environmentally hazardous project. In 2007 a fire killed two firefighters at the site. 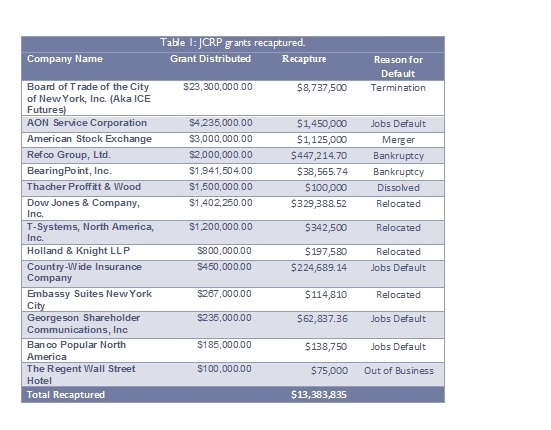 Each JCRP agreement includes a clawback provision that requires firms to return part of the grant if it does not create the jobs promised or if it moves jobs and/or operations out of New York City. Penalties are generally strongest in the first and second years of the deal. GJNY has long pushed for strong clawback provisions in economic development deals and is pleased to see this first public evidence of recaptures by ESDC. However, as chart 2 indicates, the actual percentage of money clawed back is low in many cases. Grants for Employees’ Loss of Life: Ten firms received $33 million from a special allocation of CDBG funds from the New York Firms Suffering Disproportionate Loss of Workforce program. The lion’s share has gone to Cantor Fitzgerald; after merging with another JCRP program recipient, the firm is eligible to receive approximately $6.8 million more in JCRP funds. To be eligible for the program, firms have to have had “suffered a loss of life equal to at least six permanent employees AND at least 20% of its permanent workforce OR at least 50 permanent employees located in New York City.” Learn more about the program on the Lower Manhattan Development Corporation’s website. Table 2: Recipients of the Disproportionate Loss of Workforce program. *Note: Recipients of this program were required to provide jobs data only for 2004 and 2005. Information for those that provided jobs data beyond these years can be found in our Database of Deals. GJNY has long advocated for an accountable and equitable use of economic development funds and believes, like many fiscal watchdogs and CEOs alike, that subsidies do not persuade location decisions of large firms in the finance and real estate industries. For companies to move or expand operations and create jobs, access to workforce, transportation and infrastructure, and a cluster of like-minded businesses guide location decisions more than taxes. With that caveat and due to weak transparency on the state level, GJNY finds that a concise figure of job impacts remains elusive. A December 2010 report to the U.S. Department of Housing and Urban Development claims 30,000 jobs were created or retained by 40 JCRP recipients that benefited from the LMDC allocation. This job count corroborates data we received from ESDC that tallies job totals for both agencies, approximately doubling the jobs cited in the HUD report. 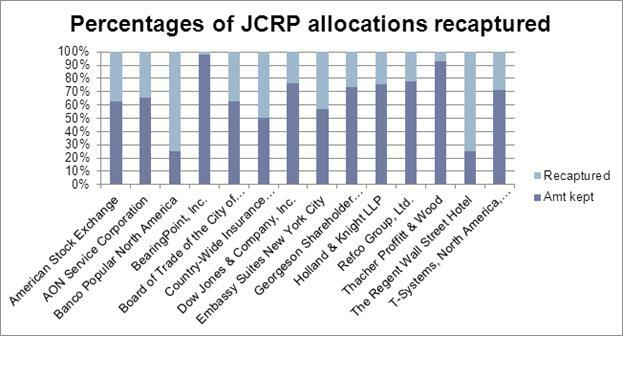 (Prior to the creation of LMDC, the ESDC allocated JCRP grants.) We encourage New York State to emulate recent transparency efforts like those at the New York City Industrial Development Agency. Grants continue: In early August of this year, ESDC announced a $3 million JCRP grant for Oppenheimer & Co. Because this grant was announced so recently it is not in our database. More information about the proposal is available here. See more: Information on other CDBG-funded economic development programs created after 9/11 – including several thousand recipients of the Business Recovery Grant (BRG), Small Firm Attraction and Retention Grants (SFRAG) and the special $8 Billion allocation of Private Activity Bonds (aka “Liberty Bonds”) – are available in the Database of Deals and our Reconstruction Watch section of our website. There you will also find descriptions of various incentives being offered in Lower Manhattan from the City and State commercial subsidy program known as “the Marshall Plan.” In addition, in August 2011 the New York City Independent Budget Office released a summary of Federal Aid to New York City after 9/11.